Cherry Clafouti, Julia Child, and Stella . . . I'll bet you're among the huge flock of bakers out there who are looking forward to the Julia Child movie, Julie & Julia, that will be in theaters soon, yes? I know I am. I figure it's a good bet that a hefty percentage of the people interested in this film feel some sort of personal connection--and I don't mean in a touchy-feely encounter-group sort of way--to the memory of Julia Child as we knew her from public television. My own relationship with the TV personage of Julia Child was channeled, if you will, through my mom, whose name was Stella. Back then, there were only a couple of cooking shows on TV that I can recall--Julia's, and Graham Kerr's Galloping Gourmet. My mom loved watching them both, especially the former. As kids, my older sister Joanie and I spent hours at my mom's side on summer afternoons while Julia chirped away on the screen in black and white, instructing American housewives of the proper way to render goose fat, unmold coeur a la creme, or achieve the perfect golden crust on a baguette. The three of us would perch on the big bed in my parent's room, a summer breeze moving through the pristine white curtains, and all of us folding clean laundry for the thirty minutes or so of the show. (Joanie and I eventually came to label my mom's particular--and more or less mandatory--towel folding technique as "The Stella Fold.") That's got to be one of my fondest old memories. Not that I loved the program. In fact, I thought Julia's voice was just awful. I can still hear her breath-laden, overly lengthy pronunciation of the word tomatoes as "tommaaaatoes." But, Julia was pleasingly far from intimidating and, clearly, Stella felt some kind of kinship with her enthusiasm and gutsy confidence when it came to food. That brief half hour represented a cheery, and very female, domestic diversion in the middle of a typical summertime weekday. Stella, just like Julie Powell's mother, had her own set of Child's two-volume masterwork. Well worn as an old pair of fine leather gloves, and pictured above, those books inhabited my parents' house for decades, alongside dozens of other somewhat less awe-inspiring cookbooks. This spring, when I began reading Powell's book, I took Stella's volumes off the shelf where they'd stood undisturbed for a few years now, reverently blew the dust off the bindings (if such a thing can be reverently done), and brought them home to join my own ever expanding cookbook collection. Since Stella's death at the age of 79, two and a half years ago, I'd already taken--with my father's blessing--the vast majority of her wonderful cookbooks, but I'd hesitated when it came to removing these seminal tomes. It had seemed to me that removing them too soon would be unseemly, not in any formal sense that anyone else would notice, but just in terms of my own knowledge of how much they belonged so expressly to her, and because of my sense of how much joy she must have derived from them. The only Julia Child recipes that I know for certain my mom used were for breads. She perfected, through literally hundreds of batches, the most delicious homemade breads I've ever tasted. Probably her greatest triumph was her French baguette. Until I entered culinary school this past spring, and was offered slices from a very fresh baguette created (I assume!) by the artisan breads class, I didn't realize how completely perfect--truly perfect--Stella's breads must have been. I have renewed admiration and appreciation for her talent and perseverance as a baker, based on that recent experience alone, and I had quite a bit to start with. A few days after Julia Child died, in August of 2004, my husband and I traveled with our kids on a trip we'd planned to Washington D.C. and while there we made the obligatory trip to the Smithsonian. Julia's actual home kitchen--all of her own belongings, I believe--had recently been recreated and installed in a display there, not too far from the First Ladies' inaugural gowns. It seemed fitting to me that I was able to see her kitchen so soon after her passing. It looked at the same time cluttered, functional, and comfortingly well used. That experience, of looking at the objects she must have handled over and over, is part of what I think of when I think of Julia. I wish my mom could have seen that kitchen too; I imagine she would have stood there gazing quietly, examining all the details for a long time, smiling to herself. My sister, several years ago, went to one of Julia's book-signings in Cambridge, Massachusetts, and that year for Christmas she gave me an autographed copy of the book Baking With Julia. Of all the cookbooks I own, that is the one I am least likely to part with. In homage to Julia, and in honor of Stella (who adored sweets of every stripe), I made Julia's very simple and very French recipe for cherry clafouti (accent on the last syllable, bakers!). An eggy, custardy dish, that is sometimes served as part of a breakfast meal, clafouti is also served as a dessert. 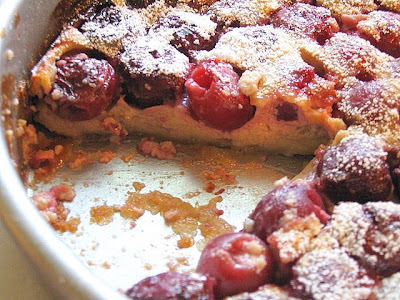 Julia's clafouti recipes, with several variations, appear in Volume I of Mastering the Art of French Cooking. Preheat oven to 350 degrees. Lightly butter a 7 or 8 cup baking dish (or a 9" cake pan will work). Using a blender (by necessity I used my food processor and it worked fine) combine the milk, half the sugar, eggs, vanilla, salt, and flour. Pour one quarter of the batter into the pan. Place the dish in the oven just until it sets. Remove from the oven and spread the cherries over the batter. Sprinkle on the remaining sugar. Pour on the remaining batter. Bake for 45 minutes to 1 hour, until the clafouti is puffed, brown, and a knife inserted in the center comes out clean. Sift the top with the powdered sugar. Serve warm. Peach-Blueberry Cake . . . or, if you prefer, Nectarine-Blueberry Cake . . . When I was expecting a baby in July of 1996, late in my third trimester, I was hungry. My doctor had advised me in those last couple of weeks to keep my weight steady, not to gain, and I was carefully adhering to his advice. I was also, apparently, clipping recipes from magazines for delectable baked goods I would have to indefinitely put off trying out. (I think I must have been really hungry.) One such item was this cake recipe, which surfaced recently in a little black notebook where I had taped it neatly for future use. Now, I'm not in the habit of neatly taping things into notebooks, so it was probably the nesting instinct that made me do that. I was nesting alright. One look at the military precision with which I had organized the baby's room--particularly all the paraphernalia on the changing table--attested to this. Everything in it's proper place, right down to the Desitin and baby wipes. I was prepared. Newborn-sized diapers stood at attention in neat little stacks, just awaiting the signal to spring into action. Yes, we women can be astoundingly organized when new babies impel us to be so (we're amazing that way, aren't we?). And, apparently, clipping recipes for baked delicacies I could not eat at the time, was just another outlet for my obvious need to systemize things before the Big Event. Anyway, until yesterday I'd never tested out this summery cake recipe and, this being summer and all, I figured I might as well finally give it a go. The original recipe's title, Peach-Blueberry Pound Cake, is something of a misnomer. This is not--in my sole opinion--a pound cake, thus I have changed the name of the recipe below to reflect that. It doesn't really have the density or texture of a pound cake, and the process for putting it together doesn't mirror the majority of garden-variety pound cake formulas that I've ever seen. (It doesn't even call for any sort of extract or flavoring at all--that in itself is uncustomary, don't you think?) It is a good cake, but I'd say it straddles the fence between being a coffee cake and a huge cake-shaped muffin. You can hold a piece of it in your hand to eat it, or savor it with a fork. Your choice. It was originally intended to be made with peaches but I just had nectarines on hand so I used those and they worked out fine. Besides that minor change, the only other thing I altered was to reduce the total amount of fruit required. I thought the recipe called for significantly more fruit than could be absorbed, or supported if you will, by the cakey part itself. I am pretty sure I was on target. The amount of fruit in the version of the recipe I prepared seems just right. It's a rather light cake, actually, and it would be very at home served along with a special breakfast or brunch, though it also makes a perfectly respectable dessert. It could probably be dolled up with a little dollop of whipped cream on top, to make it even more respectable. Preheat oven to 350 degrees. Grease and flour, or use baking spray to coat (that's always the easiest option when you're dealing with a funny shaped pan), a 10" tube pan with a removable bottom. Heat milk and butter in a small sauce pan until butter melts. Set aside to cool slightly. Peel and slice peaches/nectarines into 1/2" chunks. (If you like, blanch and shock them first to make removing the skin much easier; this works extremely well with very ripe fruit, particularly peaches, but not so well with really firm, less ripe fruit.) Set the chopped fruit aside. Beat the eggs and sugar in a large mixer bowl until they're thick and and pale, for about 5 minutes. On low speed, mix in the baking powder and salt. Add the flour in two additions, alternately with the warm butter mixture, until thoroughly combined. Fold in all of the fruit gently. Let the cake cool, in the pan, on a rack for about half an hour. Run a very thin knife or spatula around the sides of the cake to help loosen it from the pan. Remove the outer portion of the pan, and let the cake finish cooling completely on its base before inverting the cake onto the rack, and then flipping it back onto its serving plate so the top is right-side up. P.S. That 1996 baby was a boy, and when he saw me making this cake yesterday he said (in kind of a whiney voice), "Mommm, how come you're always making all kinds of other things lately, and not chocolate chip cookies???" So pitiful was his mournful plea, I decided to be merciful. So I'm off now to make a little batch of the cookie-that-never-fails-to-please-adolescent-boys, the mighty chocolate chip. Till next time . . . Recipe Full Disclosure! This recipe, in its original form, appeared in the May 1996 issue of Woman's Day magazine, and it was titled, "Peach-Blueberry Poundcake." What does one do with a five-pound bag of large-shredded, unsweetened coconut? Unless you're planning to open a macaroon shop sometime soon, you probably have no business purchasing that much. Think about it bakers . . . five pounds is a lot of coconut. But when I bought it I couldn't help myself. Caught up in the moment, thrilled at the sight of this kind of coconut to begin with (only the sweet, moist, tiny-shredded stuff is ubiquitous around here), astounded at the price (less than $15.00 for the bag), and charmed by the lovely creamy color of the curly flakes . . . well, clearly it was inevitable. Maybe you would have done the same thing . . . ? I know you're dying to ask where I obtained that moderately priced, pillow-sized bag of our favorite, indispensable, tropical staple, right? At Detroit's Eastern Market, of course. The "historic Eastern Market" (it's well over 110 years old), as it's affectionately termed, is the largest farmer's market in Michigan. Located just east of downtown Detroit, it's a relatively short drive from the small city where we live. To say that the Market is beautifully colorful is a profound understatement. It is vivid in every way--even the smells are wonderful. It's fertile territory for people watching, too, even if you're not really there to spend money. So much freshness everywhere you look--produce of every description, annuals and perennials, house plants, fresh cut flowers, unusual spices, poultry, fish and shellfish, sausages, cheeses, meats (and meat parts that you've probably never heard of and didn't know existed), nuts, dried fruits, breads, and bakery items. You name it, you can probably find it. Forgive me, I digress. Back to the gigantic bag of coconut. As you can imagine, I've been itching to use some of the flaky white stuff in a recipe and this morning I had my chance. 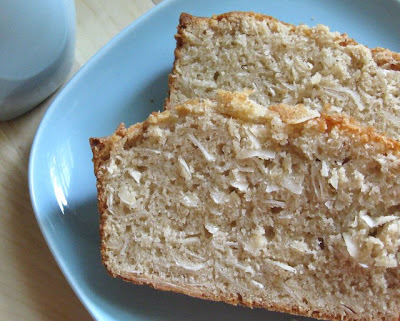 After searching the last couple of days through cookbooks and food blogs for an enticing coconut bread recipe, the best candidate was turned up via the foodie website called Baking Bites. It comes from Bill Granger, an Australian celebrity chef who owns a restaurant where this bread is a mainstay. Word on the street is that they serve it thickly sliced, toasted, and generously buttered. It is, according to fans, to die for. That recommendation was good enough for me so I gave the recipe a whirl, and the results are in. It is very good. Fair warning though: The texture of the bread is substantive, hearty, and chewy. One slice is probably going to be plenty at one sitting, unless perhaps you're a linebacker or you're pregnant with twins. The flavor is really nice, with a slight cinnamon thread throughout. It's the kind of quick bread that can be sliced, wrapped in a napkin, tossed in a backpack or lunch-bag, and hauled out hours later still in one piece and still delicious. Because the original recipe is so revered, I figured I'd better not fiddle with it the first time out, so I made one loaf almost exactly as indicated. Then, because you know I can't help myself when it comes to this kind of thing, I had to make another loaf with my own alterations. They are both good breads. I've listed the two recipe versions below. The second version--the Jane Version--contains the addition of lime juice, lime zest, coconut milk in place of some of the regular milk, less butter, and much less cinnamon than the original recipe. Also, my bread's version is glazed with a very light, thin, sweet lime glaze. Mmmmmm . . . yummy. Preheat oven to 350 degrees; grease and flour a 9" x 5" loaf pan. In a medium bowl, whisk eggs, milk, and vanilla extract. Make a well in the center of the dry ingredients and pour in the egg mixture. Stir just until combined and a few streak of flour remain. Add in the melted butter and stir just until smooth. Don't overmix. Pour into loaf pan and, if you like, sprinkle sugar over the top (I did this but it's not part of the original recipe). Bake for about 60 minutes (my loaves took maybe 50 minutes) or until a toothpick inserted in the center comes out clean. Cool in pans on a rack for about five minutes; turn out of pan and finish cooling on a rack. In a medium bowl, whisk eggs, coconut milk, regular milk, lime juice, and vanilla extract. Make a well in the center of the dry ingredients and pour in the egg mixture. Stir just until combined and a few streaks of flour remain. Pour into loaf pan. Bake for about 60 minutes (my loaves took maybe 50 minutes) or until a toothpick inserted in the center comes out clean. When the loaf is cool, mix about 1/2 cup confectioner's sugar with the 2 Tbsp. fresh lime juice, and 1 tsp. lime zest. Stir until smooth and any sugar lumps dissolve. If too thick, add more sugar; too thin, add more juice. Pour, in a thin stream, all over the top of the loaf; let it drip down the sides. Let the loaf sit uncovered for a while so the glaze can soak in. Store the loaf loosely covered once the glaze is no longer completely wet. 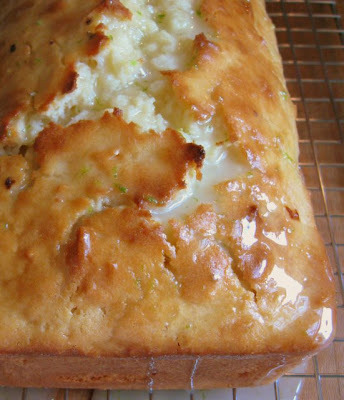 Below is a picture of the coconut-lime bread . . . it's yellower than the other loaf. . . looks delish, doesn't it? It smells pretty good too. It's shown here just out of the oven, without the glaze on. So go ahead! Cut a little slice and try it out. What do you think? Any thoughts to share? Lemon Yellow and Holland Blue: Crunchy Lemon Poppy Seed Cookies . . .
Have you ever looked closely at poppy seeds? I mean really closely? They're actually not black, but an unusually appealing shade of grayish blue. And they're not essentially tasteless, as they've often seemed to me in the past. Think about it . . . you're munching a deli sandwich made with a poppy seed roll on your lunch hour; do you even have the time or inclination to truly taste the poppy seeds, much less admire their color, or to pay them any mind at all? I thought not. The only reaction you might have to them is annoyance when one becomes stuck in your teeth, right? In the U.S. at least, they go mostly unnoticed and get little respect. Based on my now decades-long perusal of baking cookbooks, you're far more likely to see them used in European recipes. But that's too bad, because heaven knows they're no Johnny-come-lately to the pantry. In comparison to most of the things we throw into our everyday American chow, they're an old and distinguished soul. Native to Asia, the tiny dark seeds are rich in history. They've been used medicinally for centuries. In ancient cultures they were valued for metaphysical, as well as practical, properties. Luckily for us, they willingly lend their esoteric magic to baked goods. Whoever first had the idea to combine the flavor of lemon with poppy seeds was certainly on the right track. The toasted-nutty flavor of poppy seeds--for that is how they taste when we pay attention--is pretty subtle. Diminutive seeds that they are, they simply don't blow their own horn. Combining them with another distinct flavor is almost always a good idea, and they just cohabit so nicely with lemon. Thus we have today's recipe for lemon poppy seed cookies. Now, if you don't like crunchy cookies, and I mean really crunchy cookies, you probably won't write home about these babies. I'm sure there are more delicate, fragile cookies that could be made beautifully with lemon and poppy seeds, this just doesn't happen to be one of them. This is the kind of cookie you can dunk in a cup of hot tea knowing that it won't immediately fall apart and dissolve, the kind of cookie you can nibble on slowly, savoring the small chewy seeds and the nice citrus aspect. It's like a very firm shortbread. Firm firm. Not convinced? Are you worried about those opium rumors? Have you been watching the Seinfeld rerun where Elaine eats a lemon poppy seed muffin, and frets because she thinks it caused her to flunk a drug test at work? Well, not to worry. The poppy seeds used in our food (as opposed to whatever it was Elaine may have ingested) are mature seeds, not the unripe seeds that contain the milky stuff from which opium can be extracted. It's the mature seeds we're baking with, and the best ones come from Holland. So while you might very well become a cookie junkie (and there are support groups to help you with that), chances are slim and none that you'll become an opium addict from using poppy seeds in your pastry. Okay, good. Grab your car keys and go buy some premium Holland Blue poppy seeds. Then go home and make some cookies! Preheat oven to 325 degrees. Line a couple of cookie sheets with parchment paper or Silpats. Chill the dough in the fridge or freezer for at least 20 minutes. (Good idea to chill your cookie sheets in the freezer or fridge also, if you can manage it.) After the dough is cold, portion them onto the sheets. I used a No. 50 sccop for these; that holds about 1 and 1/4 Tbsp. Place the cookies about two inches apart. Put a few tablespoons of sugar in a shallow bowl. Find a small drinking glass that's completely smooth on the bottom; dampen the bottom and dip it in the sugar, then use that to press down the cookies, as pictured. For each cookie, dip the glass again in the sugar. Recipe Full Disclosure: This recipe derives in part from the recipe for "Tangy Lemon Butter Cookies" in George Geary's The Complete Baking Cookbook. I changed the formula by adding in the poppy seeds, increasing the salt slightly, using butter and shortening instead of butter and oil, adding in lemon juice, increasing the amounts of vanilla and lemon extracts, and halving the amount of baking soda to make the cookies crunchier and more shortbread-like. *I bought my Holland Blue seeds at a Penzey's spice store. Fresh Sweet-Cherry Coffee Cake . . . Yum . . .
Summer Food and Fun in Northern Michigan . . .
Kahlua-Soaked Mocha Pound Cake Trifle . . .